Users of Google Maps for Android have been able to save maps for offline use for a while, but now the app is getting a new WiFi only mode that will come in handy to those with limited or expensive data plans who want to avoid overages. With the current offline mode you need to first download an area to be able to use it when there’s no connection, but as soon as your phone gets a signal it will switch back to using data. Now, however, you can tell Google Maps to only use Wi-Fi data without having to turn off mobile data system wide, so other apps can continue to use you carrier’s Internet connection. The new feature should be useful in publicly connected areas and will otherwise rely on previously downloaded mapping data. That said, Google does note that it might still use a small amount of cellular data, presumably to check on traffic data or other important updates. You can turn on WiFi-only mode from the Settings menu. To save maps to your device, you can go to “Offline areas” in the app’s menu, and then hit the plus button to add a new area. In addition to WiFi-only mode, Google has also complemented its offline capabilities in Maps with the ability to save maps to an external SD card. 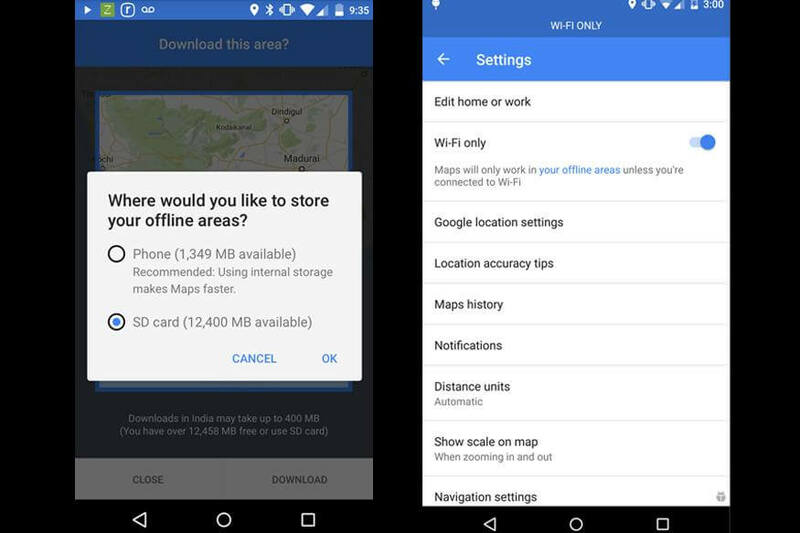 The feature is pretty self explanatory, to use it go to settings in the “Offline areas” submenu, and select “Storage preferences.” You can download the new version of Google Maps right here.